Every day tens of millions, perhaps even hundreds of millions, of containers are filled with viscous products from a variety of industries, ranging from automotive, to food, cosmetics, pharmaceuticals, and even aerospace. You may have never thought about how your shampoo was placed into its container in such an accurate manner that the weight of each bottle is almost always exact, or how drug dosages are divided in such a precise way, at rapid speeds, when even the smallest error could have major consequences. This is all done through the use of sophisticated pump and dosing technology. One of the leaders within this field is ViscoTec. A company whose roots stem back to 1980, Germany-based ViscoTec considers themselves a premium brand for dosing systems and components. They cater to numerous industries and pride themselves on the reliability, efficiency, and precision of their products. If you think about it, dosing technology has a lot in common with the components used within FFF/FDM 3D printers. Just like an extruder on a printer slowly releases a specific amount of molten plastic, dosing technology does the same basic thing with viscous materials, only that the process has to be even more precise. Realizing the overlap in the technologies, ViscoTec has announced that they are entering the 3D printing space. As you can see from the video and images posted throughout this article, ViscoTec seemingly has managed incredibly precise deposition of viscous materials such as silicone, UV-curing adhesives, and two component adhesives, among others. We have seen several different paste extruding machines come to market recently; however, none of them I have seen had the accuracy, precision, and fine nozzle diameters which are obviously present within ViscoTec’s technology, judging from the video below. 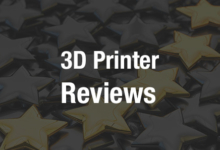 The company states that they feel they possess several advantages within the 3D printing industry because of their vast experience working with dosing technologies. They are currently able to print at a layer thickness of 0.2mm, at a speed as as fast as 1 ml/minute. This of course depends on the thickness of the material being extruded, but the company claims that they can even handle some of the thicker materials out there with ease.